Claudia Chase, owner of Mirrix Looms has a new passion: tapestry/bead cuffs. Claudia has been weaving tapestry since 1984 and weaving beads since 1998. She is also an avid dyer and spinner, frequently using those materials in her tapestries. Her most recent endeavor in tapestry is her new line of tapestry/bead cuffs. The cuffs consist of hand spun and hand dyed silk, perle cotton, linen, novelty yarns and glass seed beads. With these cuffs she is exploring the combination of rich, deep colors and textures in a very small format. You can learn more about Claudia's work at her blog too. 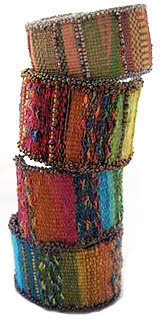 Fabulous fiber cuffs, super colors!